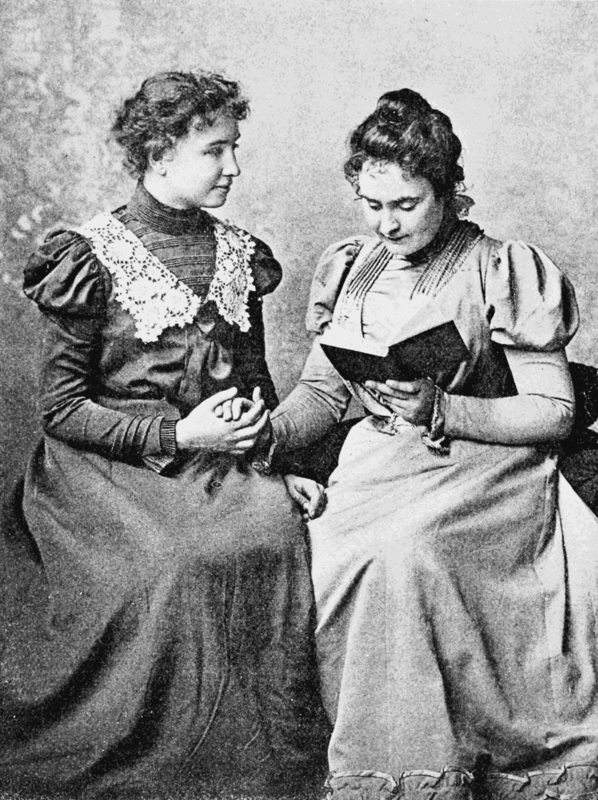 AS THE feat may seem almost incredible, it may be in order to say at the beginning that every word of this story as printed in THE JOURNAL has actually been written by Helen Keller herself — not dictated, but first written in “Braille” (raised points); then transferred to the typewriter by the wonderful girl herself; next read to her by her teacher by means of the fingers; corrected; then read again to her, and in the proof finally read to her once more. It is the editor’s hope to be able to publish at the conclusion of Miss Keller’s own story a supplementary article by one of her friends, explaining, in detail, exactly how this marvelous work was done. THE EDITOR OF THE LADIES’ HOME JOURNAL. IT IS with a kind of fear that I begin to write the history of my life. I have, as it were, a superstitious hesitation in lifting the veil that clings about my childhood like a golden mist. When I try to classify my earliest impressions I find that fact and fancy look alike across the years that link that period with the present. The woman paints the child’s experiences in her own fantasy. A few impressions stand out vividly from “the first years of my life; but the shadows of the prison-house are on the rest.” Besides, many of the joys and sorrows of childhood have lost their poignancy; and many incidents of vital importance in my early education have been lost sight of in the excitement of great discoveries. In order, therefore, not to be tedious I shall try to present in a series of sketches only the episodes that seem to me to be the most interesting and important. I WAS born June 27, 1880, in Tuscumbia, a little town of Northern Alabama, and lived up to the time of the illness that deprived me of my sight and hearing in a tiny cottage consisting of a large square room, and a small one in which the servant slept. My father built this cottage for an office after the Civil War, and when he married my mother they went to live in it. It was completely covered with vines, climbing roses and honeysuckle. From the garden it looked like an arbor. The little porch was hidden from view by a screen of yellow roses and Southern smilax. It was the favorite haunt of humming-birds and bees. The old house where the family lived was a few steps from our little rose bower, and was also vine-covered. The homestead was called “Ivy Green” because the house and the surrounding trees and fences were covered with beautiful English ivy. Its old-fashioned garden was the paradise of my childhood. Even in the days before my teacher came I used to feel along the square, stiff boxwood hedges, and, guided by the sense of smell, would find the first violets and lilies. There, too, after my fits of temper I went to find comfort and to hide my hot face in the cool leaves and grass. What joy it was to lose myself in that garden of flowers, to wander happily from spot to spot, until coming suddenly upon a beautiful vine, I recognized it by its leaves and blossoms, and knew it was the vine which covered the tumble-down summer-house at the farther end of the garden! Close by were trailing clematis, drooping jessamine, and some rare sweet flowers called butterfly lilies, because their fragile petals resembled the butterfly’s wings. But the roses — they were loveliest of all. Never have I found in the greenhouses of the North such heart-satisfying roses as the climbing roses of my Southern home. They used to hang in long festoons from our porch, filling the whole air with their fragrance, untainted by any earthly smell; and in the early morning, washed in the dew, they felt so soft and seemed so pure. I could not help wondering if they did not resemble the asphodels of God’s garden. THE family on my father’s side are descended from Caspar Keller, a native of Switzerland, who settled in Maryland. 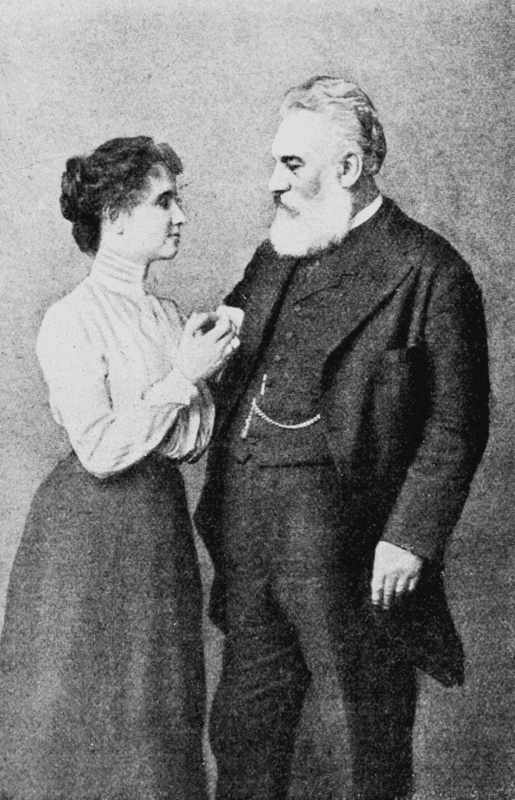 One of my Swiss ancestors was the first teacher of the deaf in Zurich and wrote a book on the subject of their education — rather a singular coincidence. My grandfather, Caspar Keller’s son, “entered” large tracts of land in Alabama and finally settled there. I have been told that once a year he went from Tuscumbia to Philadelphia on horseback to purchase supplies for the plantation, and my aunt has in her possession many of the letters to his family, giving charming and vivid accounts of these trips. My Grandmother Keller was a daughter of Alexander Moore, one of Lafayette’s aides, and granddaughter of Alexander Spotswood, an early Colonial Governor of Virginia. She was also second cousin to Robert E. Lee. My father, Arthur Keller, was a Captain in the Confederate Army, and my mother was his second wife and many years younger. Her grandfather, Benjamin Adams, lived in Newburyport, Massachusetts, for many years. His wife was Anna E. Goodhue. Their son, Charles Adams, was born in Boston and moved to Helena, Arkansas, before the Civil War; and when the war broke out took sides with the South and became a Brigadier-General in the Confederate Army. He married Helen Everett who belonged to the same family of Everetts as Edward Everett and Dr. Edward Everett Hale. After the war was over the family moved to Memphis, Tennessee. THE beginning of my life was simple and much like every other little life. I came, I saw, I conquered, as the first baby in the family always does. I am told that while I was still in long dresses I showed many signs of an eager, self-asserting disposition. Everything that I saw other people do I insisted upon imitating. At six months, I could pipe out “How d’ye,” and one day I attracted every one’s attention by saying “Tea, tea, tea” quite plainly. Even after my illness I remembered one of the words I had learned in these early months. It was the word “water,” and I continued to make some sound for that word after all other speech was lost. I ceased making the sound “wah-wah” only when I learned to spell the word. They tell me I walked the day I was a year old. My mother had just taken me out of the bathtub and was holding me in her lap when I was suddenly attracted by the flickering shadows of leaves that danced in the sunlight on the smooth floor. I slipped from my mother’s lap and almost ran toward them. The impulse gone, I fell down and cried for my mother to take me up in her arms. I still have confused recollections of that illness. I especially remember the tenderness with which my mother tried to soothe me in my waking hours of fret and pain, and the agony and bewilderment with which I awoke after a tossing half sleep, and turned my eyes, so dry and hot, to the wall, away from the once-loved light, which came to me dim and yet more dim each day. But, except for these fleeting memories, it seems very unreal, like a nightmare. Gradually I got used to the silence and darkness that surrounded me, and forgot that it had ever been different, until she came — my teacher — who was to set my spirit free. I cannot recall what happened during the first months after my illness. I only know that I sat in my mother’s lap, or clung to her dress as she went about her household duties. My hands felt every object and observed every motion, and in this way I learned to know many things. Many incidents stand out from those early years, isolated, but clear and distinct, making the sense of that silent, aimless, dayless life all the more intense. Soon I felt the need of some communication with others and began to make crude signs. A shake of the head meant “No,” and a nod, “Yes”; a pull meant “Come,” and a push, “Go.” Was it bread that I wanted? Then I would imitate the acts of cutting the slices and buttering them. If I wanted my mother to make ice cream for dinner I made the sign for working the freezer, and shivered, indicating cold. My mother, moreover, succeeded in making me understand a good deal. For instance, I always knew when she wished me to bring her something, and I would run upstairs or anywhere else she indicated. Indeed, I owe to her loving wisdom all that was bright and good in my long night. I DO not remember when I first realized that I was different from other people, but I knew it before my teacher came to me. I had noticed that my mother and my friends did not use signs the way I did when they wanted anything done, but talked with their mouths. Sometimes I would stand between two persons who were conversing and would touch their lips. I could not understand, and was vexed. I moved my lips and gesticulated frantically without result. This made me so angry at times that I kicked and screamed until I was exhausted. I understood perfectly when I was naughty, for I knew that it hurt Ella, my nurse, to kick her, and when my fit of temper was over I had a feeling akin to regret. But I cannot remember any instance in which this feeling prevented me from repeating the naughtiness when I failed to get what I wanted. In those days a little colored girl, Martha Washington, the child of our cook, and Belle, an old setter and a great hunter in her day, were my constant companions. Martha Washington understood my signs, and I seldom had any difficulty in making her do just as I wished. It pleased me to domineer over her, and she generally submitted to my tyranny rather than risk a hand-to-hand encounter. I was strong and active, and indifferent to consequences. I knew what I wanted and was ready to fight for it, and to fight tooth and nail against everything I did not want. We spent a great deal of time in the kitchen, kneading dough balls, helping make ice cream, grinding coffee, quarreling over the cake-bowl, and feeding the hens and turkeys that swarmed about the kitchen steps. Many of them were so tame that they would eat from my hand and let me feel of them. One big gobbler snatched a tomato from me one day and ran away with it. Inspired, perhaps, by Master Gobbler’s success, we carried off to the woodpile a cake which the cook had just frosted, and ate every bit of it. I was quite ill afterward, and I wonder if retribution also overtook the turkey. Two little children were seated on the veranda steps one hot July afternoon. One was as black as ebony, with little bunches of fuzzy hair tied with shoestrings sticking out all over her head, and the other was white with long golden curls. One child was six years old, and the other two or three years older. The younger child was blind — that was I — and the other was Martha Washington. We were busy cutting out paper dolls; but we soon wearied of this amusement, and after cutting up our shoestrings and clipping all the leaves off the honeysuckle that were within reach, I turned my attention to Martha’s corkscrews. She objected at first, but finally submitted. Thinking that turn and turn about is fair play, she seized the scissors and cut off one of my curls, and would have cut them all off if my mother had not appeared in the nick of time. SOON after this I had an experience that I remember vividly. I happened to spill water on my apron and I spread it out to dry before the fire, which was flickering on the sitting-room hearth. But the apron did not dry quickly enough to suit me and I drew nearer and threw it right over the hot ashes. The fire leaped into life; the flames encircled me so that in a moment my clothes were blazing. I made a terrified noise that brought my nurse, Viny, to the rescue. Throwing a blanket over me she almost suffocated me, but she put out the fire. Except for my hands and hair I was not badly burned. The making ready for Christmas was always a delight to me. Of course, I did not know what it was all about, but I enjoyed the pleasant odors that filled the house and the tidbits that were given to me and Martha Washington to keep us quiet. We were sadly in the way, but that did not interfere with our pleasure in the least. They allowed us to grind the spices, pick over the raisins and lick the stirring spoons. I hunted my stocking because the others did; but I cannot remember that the ceremony interested me especially, nor did my curiosity cause me to wake before daylight to look for my gifts. The sheds where the corn was stored, the stable where the horses were kept, and the yard where the cows were milked morning and evening were unfailing sources of interest to Martha and me. The milkers would let me keep my hands on the cows while they milked, and I often got well switched by the cows for my curiosity. ABOUT this time I found out the use of a key, and one day I locked my mother up in the pantry, where she was obliged to remain three hours as the servants were in a detached part of the house. She kept pounding on the door, while I sat outside on the porch steps and laughed with glee as I felt the jar of the pounding. This most naughty prank of mine convinced my parents that I must be taught as soon as possible. After my teacher, Miss Annie M. Sullivan, came to me, I sought an early opportunity to lock her in her room. I went upstairs with something which my mother made me understand I was to give to Miss Sullivan; but no sooner had I given it to her than I slammed the door to, locked it, and hid the key under the wardrobe in the hall. I could not be induced to tell where the key was. My father was obliged to get a ladder and take my teacher out through the window — much to my delight. Months after I produced the key. The guinea-fowl likes to hide her nest in out-of-the- way places, and it was one of my greatest delights to hunt for the eggs in the long grass. I could not tell Martha Washington when I wanted to go egg-hunting, but I would double my hands and put them on the ground, which meant something round in the grass, and Martha always understood. When we were fortunate enough to find a nest I never allowed her to carry the eggs home, making her understand by emphatic signs that she might fall and break them. Belle was old and lazy, and liked to lie by the open fire and sleep rather than to romp with me. I tried hard to teach her my sign language, but she was dull and inattentive. Sometimes she started and quivered with excitement, then she became perfectly rigid, as dogs will when they point a bird. I did not then know why Belle acted in this way, but I knew she was not doing as I wished. This vexed me and the lessons always ended in a one-sided boxing match. Belle would get up, stretch herself lazily, give a contemptuous sniff, go to the opposite side of the hearth and lie down again, and I, wearied and disappointed, would go off in search of Martha. WHEN I was about five years old we moved from the little vine-covered cottage to a large new house. The family consisted of my father and mother, two older half-brothers, and a little sister, Mildred. My earliest distinct recollection of my father is the making of my way through great drifts of newspapers to his side and finding him alone, holding a sheet of paper before his face. I was greatly puzzled to know what he was doing. I imitated this action, even wearing his spectacles, thinking they might help solve the mystery. But I did not find out the secret for several years. Then I learned what those papers were, and that my father edited one of them. My father was most loving and indulgent. He was devoted to his home, and seldom left us, except in the hunting season. He was a great hunter, I have been told, and a celebrated shot. Next to his family he loved his dogs and gun. He was hospitable almost to a fault, and seldom came home without bringing a guest. He was also proud of his garden, where, it was said, he raised the finest watermelons and strawberries in the county; and to me he brought the first ripe grapes and the choicest berries. I remember his caressing touch as he led me from tree to tree and vine to vine, and his eager delight in whatever pleased me. My father was a famous story-teller, and after I had acquired language he used to spell clumsily into my hand his cleverest anecdotes; and nothing pleased him more than to have me repeat them at an opportune moment. I was in the North, enjoying the last beautiful days of a happy summer, when I heard the news of my father’s death. He had had a short illness, there had been a brief time of acute suffering, then all was over. This was my first great sorrow — my first personal experience with death. How shall I write of my mother? She is so near to me that it almost seems indelicate to speak of her. We never dream of comparing our mother to another; it is enough that she is our mother — the being in whose beneficent tenderness is security and joy. To describe her would be like attempting to put into words the fragrance of a flower or the smile on a beloved face. FOR a long time I regarded my little sister as an intruder. I knew that I had ceased to be my mother’s only darling, and the thought filled me with jealousy. She sat in my mother’s lap constantly, where I used to sit, and seemed to take up all her care and time. One day something happened which I regarded as adding insult to injury. At that time I had a much-petted, much-abused doll, which I afterward named Nancy. She was, alas, the helpless victim of my outbursts of temper and of affection, so that she became much the worse for wear. I had dolls which talked, and cried, and opened and shut their eyes; but I never loved one of them as I loved poor Nancy. She had a cradle, and I often spent an hour or more rocking her. I guarded both doll and cradle with the most jealous care; but once I discovered my little sister sleeping peacefully in the cradle. My anger at this presumption on the part of one to whom as yet no tie of love bound me can be better imagined than described. I rushed upon the cradle and overturned it, and the baby might have been killed had my mother not caught her as she fell. Thus it is that when we walk in the valley of twofold solitude we know nothing of the tender affections that grow out of endearing words and actions and companionship. Afterward, when I was restored to my human heritage, Mildred and I grew into each other’s hearts, so that we were content to go hand-in-hand wherever caprice led us, although she could not understand my finger language, nor I her baby chatter. THE desire to express myself grew. The few signs I used became less and less adequate to convey these wants. My failures to make myself understood were invariably followed by outbursts of passion. I felt as if invisible hands were holding me, and made frantic efforts to free myself. I struggled — not that struggling helped matters, but the spirit of resistance was strong within me; I generally broke down in tears and physical exhaustion. If my mother happened to be near I crept into her arms, too miserable even to remember the cause of the tempest. After a while the need of some means of communication became so urgent that these outbursts occurred daily and sometimes hourly. My parents were deeply grieved and perplexed. We lived a long way from any school for the blind or the deaf, and it seemed unlikely that any one would come to an out-of-the-way place like Tuscumbia to teach a child who was both deaf and blind. Indeed, my parents sometimes doubted whether I could be taught. 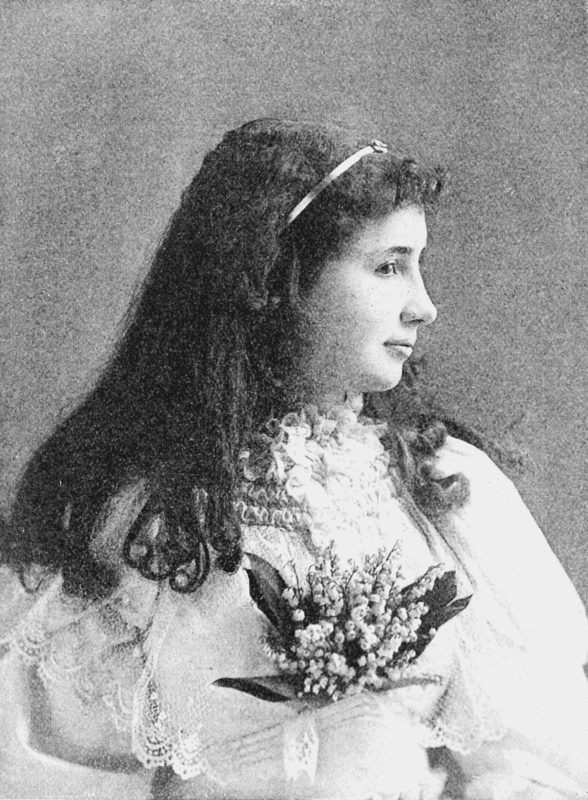 Their only ray of hope came from Dickens’s “American Notes.” My mother had read his account of Laura Bridgman, and remembered vaguely that she was deaf and blind, yet had been educated. But she also remembered with a hopeless pang that Doctor Howe, of Boston, who had brought Laura Bridgman back into the world, had been dead for many years. His methods had probably died with him; but even if they had not, how was a little girl in a far-off town in Alabama to receive the benefit of them? WHEN I was about six years old my father heard of an eminent oculist in Baltimore, who had been successful in many cases that had seemed quite hopeless. My parents at once determined to take me to Baltimore to see if anything could be done for my eyes. The journey, which I remember well, was very pleasant. I made friends with many people on the train. One lady gave me a box of shells. My father made holes in these so that I could string them, and for a long time they kept me happy and contented. The conductor, too, was kind, and often when he went his rounds I would cling to his coat-tails while he collected and punched the tickets. His punch, with which he let me play, was a great delight. Curled up in a corner of the seat I amused myself for hours making funny little holes in bits of cardboard. Some one else made me a big doll out of towels. It was the most comical, shapeless thing, this improvised doll, with no nose, mouth, ears or eyes –nothing that even the imagination of a child could convert into a face. Curiously enough, the absence of eyes struck me more than all the other defects put together. I pointed this out to everybody with provoking persistency, but no one seemed equal to the task of providing the doll with eyes. However, a bright idea came to my mind, and the problem was solved. I tumbled off my seat and searched under it until I found my aunt’s cape, which was trimmed with large beads. I pulled two beads off and indicated to my aunt that I wanted her to sew them on my doll. She raised my hand to her eyes in a questioning way, and I nodded energetically. The beads were sewed in the right place and I could not contain myself for joy; but immediately the doll lost all interest for me. During the whole trip I did not have one fit of temper, there were so many things to keep my mind and fingers busy. DOCTOR CHISHOLM received us kindly, but could do nothing. He said, however, that I could be educated, and advised my father to consult Dr. Alexander Graham Bell, of Washington, who would be able to give him information about schools and teachers of deaf or blind children. Therefore, in accordance with the doctor’s suggestion, we went to Washington to see Doctor Bell, my father with a sad heart and many misgivings, and I wholly unconscious of his anguish, finding pleasure in the excitement of moving from place to place. Child as I was, I at once felt the tenderness and sympathy which endeared Doctor Bell to so many hearts, as his wonderful achievements enlist their enthusiastic admiration. He held me on his knee while I examined his watch, and he made it strike for me. He understood my signs, and I knew it and loved him at once. But I did not dream that that interview would be the door through which I should pass from darkness into light, from isolation to friendship, companionship, knowledge, love. Doctor Bell advised my father to write to the principal of the Perkins Institution, in Boston, the scene of Doctor Howe’s great labors for the blind, and ask him if he had a teacher competent to begin my education. This my father did immediately, and in a few weeks there came a kind letter from Mr. Anagnos with the comforting assurance that a teacher had been found. This was in the summer of 1886. But Miss Sullivan did not arrive until the following March. Source: Keller, Helen, “The Story of My Life Series: Part 1,” The Ladies’ Home Journal, April 1902. Disability History Museum, http://www.disabilitymuseum.org/dhm/lib/detail.html?id=2389&&page=1 (May 2, 2014). I have a blog centered on the same topics you discuss and would love to have you share some stories/information. I know my visitors would value your work.